HERSHEY, Pa.--(BUSINESS WIRE)--The Hershey Company (NYSE: HSY) today announced it has entered into an agreement to acquire KRAVE Pure Foods, Inc., manufacturer of KRAVE jerky, a leading all-natural snack brand of premium jerky products. The transaction will allow Hershey to tap into the rapidly growing meat snacks category and further expand into the broader snacks space. KRAVE jerky offers consumers a nutritious and premium option when looking for delicious high-protein snacks. Founded in 2009 by Jonathan Sebastiani, who had a passion and desire to develop a sustaining snack to satisfy his hunger, the company is now a leader in premium jerky, the fastest-growing sub-segment of the estimated $2.5 billion U.S. meat snacks category. KRAVE jerky has catapulted into the category with its reverence to quality, all-natural ingredients and unique flavor approach, including Black Cherry Barbeque Pork Jerky, Basil Citrus Turkey Jerky and Chili Lime Beef Jerky. KRAVE jerky products are also free of gluten and high fructose corn syrup and have no added nitrites or MSG. The overall meat snacks category is growing at a double-digit pace with a compounded annual growth rate of about 10% from 2010-2014. The better-for-you, premium subset of the category, where KRAVE participates, increased at a rate of almost four times greater than mainstream brands. Hershey intends to leverage its best-in-class supply chain capabilities, consumer insights and retail relationships to accelerate growth and access to KRAVE products. Hershey will also partner with KRAVE’s talented team to continue to drive excitement and awareness of KRAVE jerky. KRAVE will remain headquartered in Sonoma, Calif., and Hershey plans to operate KRAVE as a standalone business within its Hershey North America division. Sebastiani will continue to lead the business as President of KRAVE and will report to Buck. KRAVE Pure Foods, Inc., has generated approximately $35 million in net sales over the last twelve months and was named to Forbes 2015 America’s Most Promising Companies list. In 2012, KRAVE received a minority investment from Alliance Consumer Growth. Financial terms of the transaction were not disclosed. KRAVE was advised by Deutsche Bank. Hershey will fund the acquisition through cash and available credit facilities. The closing of the transaction is subject to regulatory approvals and customary closing conditions. See the additional press release issued earlier today for information related to Hershey’s financial guidance. For more information about KRAVE jerky, please visit https://www.kravejerky.com/. For more information about The Hershey Company, please visit https://www.thehersheycompany.com/. The Hershey Company (NYSE: HSY), headquartered in Hershey, Pa., is a global confectionery leader known for bringing goodness to the world through its chocolate, sweets, mints and other great-tasting snacks. Hershey has approximately 13,000 employees around the world who work every day to deliver delicious, quality products. The company, which has more than 80 brands worldwide that drive over $7.4 billion in annual revenues, includes such iconic brand names as Hershey’s, Reese’s, Hershey’s Kisses, Jolly Rancher and Ice Breakers. Hershey is focused on growing its presence in key international markets while continuing to build its competitive advantage in North America. Additionally, Hershey is poised to expand its portfolio into categories beyond confectionery, finding new ways to bring goodness to people everywhere. At Hershey, goodness has always been about more than delicious products. For 120 years, Hershey has been committed to good business by operating fairly, ethically and sustainably to make a positive impact on society. This means contributing to a better life for employees, consumers, communities, and, ultimately, creating a bright future for children in need. This commitment is exemplified by Milton Hershey School, established in 1909 by the company’s founder and administered by Hershey Trust Company. The children who attend the school receive education, housing, and medical care – thriving as direct beneficiaries of The Hershey Company’s success. About KRAVE Pure Foods, Inc.
From the celebrated vineyards, coveted micro-climates and renowned gourmet outposts of California wine country comes, of all things, KRAVE. 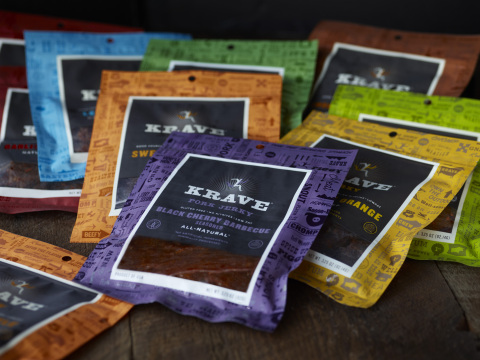 Founded in 2009, KRAVE is a leading producer of artisanal jerky, located in Sonoma. A cut above the old, leathery, chemically processed products, KRAVE represents a jerky renaissance, providing an all-natural, gluten-free snack that is both healthy and flavorful, made using only all natural, high-quality ingredients. The meat is double marinated and baked to lock in moisture. KRAVE’s meat is roasted, not dried or dehydrated, and is braised first, utilizing the “low and slow” method to produce the jerky’s signature moist and tender texture. Ranging from sweet and tangy to savory and spicy, KRAVE’s innovative flavor profiles will appeal to the everyday jerky lovers and to the discerning palates of today’s food-savvy, health conscious gourmands. For more information on KRAVE, please visit www.kravejerky.com.